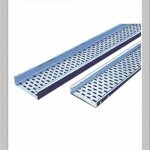 Perforated Type Cable Trays Are U Shaped M.S. Perforated, Fabricated Channels, With Center Perforation And Two Side Edges. Due To Its Perforated Design It Provides Proper Ventilation To Cables, Holding Cables In Proper Manner As Well As Provide Opportunity To Replace Or Check Cables After Long Duration Of Time.